Some time back I’ve written an article on How to Read a File Line by Line in Reverse Order which doesn’t print above requested metrics. In this tutorial we will go over steps on how to print total number of Characters, Words and Lines for a given file. 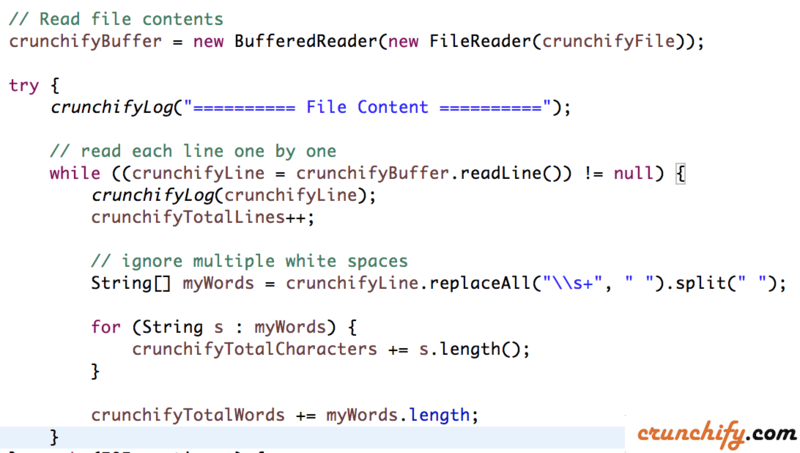 We will read file crunchify.txt first located at /Users/appshah/Downloads/ folder. I’m running program on my Macbook Pro so replace username from appshah with your actual name. What is RegEx Pattern (Regular Expression)? How to use it in Java? // that each resource is closed at the end of the statement.